November 28, 1969 Elbert Frank Cox, the first black person in the United States to receive a Ph.D. in mathematics, died. Cox was born December 5, 1895 in Evansville, Indiana. He earned his Bachelor of Science degree in mathematics from the University of Indiana in 1917. After serving in the United States Army in France during World War I, he returned to earn his Ph.D. from Cornell University on September 26, 1925. 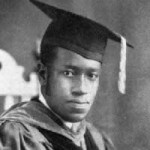 After graduation, Cox taught at West Virginia State College from 1925 to 1929 and at Howard University from 1929 to 1961. In 1980, the National Association of Mathematicians established the Cox-Talbert Address which is given annually at their national meeting. Also, Howard University established the Elbert F. Cox Scholarship Fund to help black students pursue their studies.